Every year at the Grammy Awards, a section of the night is dedicated to musicians who have died over the course of the past 12 months. 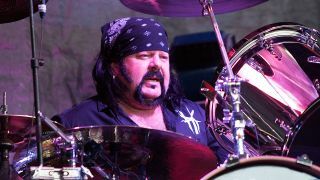 However, Sunday night’s event has drawn criticism from many in the music world for failing to mention many key names – including drummer Vinnie Paul. Hale says: “It was a whirlwind of a Grammy week. It was so wonderful to be nominated, and I’m honoured to have lost that Grammy to one of my influences, Chris Cornell. His children got up on stage and filled my heart with such love as they paid tribute to their father. “But I am disappointed and disheartened that Vinnie Paul of Pantera and Hellyeah, All That Remains guitarist Oli Herbert and Kyle Pavone of We Came As Romans were not acknowledged in the Annual Memoriam list this year. “There's a committee at the Recording Academy and, in December, they put together a list that goes into the hundreds – 300 to 400 people. They go through that list and this committee votes. And from that, they cut it down to a reasonable number for TV. I get it. But that is not an excuse for not including my friend Vinnie Paul who has been nominated for four Grammy awards. Hale continues: “This is why I’m involved. That’s why I was there in my leather jacket and horns raised, representing my genre and presenting awards at the pre-televised ceremony. That is why I was present at the TV show, sitting next to the cool kids. “Like anything in this world, if you want change, you must take action. If I threw in the towel the first or hundredth time someone didn’t take me seriously or told me I couldn’t make it because I was a girl, then all the hard work and passion I bear for my love of music would be wasted. The ceremony honoured artists including Aretha Franklinand Lynyrd Skynyrd’s Ed King, but failed to mention the Buzzcocks’ Pete Shelley and Frightened Rabbit frontman Scott Hutchison.